The poetry of the First World War has determined our perception of the war itself. This volume features poetry drawn from old newspapers and journals, trench and hospital magazines, individual volumes of verse, gift books, postcards, and a manuscript magazine put together by conscientious objectors. There are many anthologies of poetry of the First World War, reflecting the huge interest there is in this subject, but "Voices of Silence" is unlike any of them. The poetry of the First World War has determined our perception of the war itself. Yet, this perception is based on the interpretation of a few poets who have become household names - writers such as Wilfred Owen, Siegfried Sassoon and Isaac Rosenberg. Less literary but equally important, the poetry gathered together in this volume has been drawn from old newspapers and journals, trench and hospital magazines, individual volumes of verse, gift books, postcards, and an illicit manuscript magazine put together by conscientious objectors. For the first time, the huge body of rich, exciting and often deeply moving work that complements the established literary canon has been revived. It adds a new dimension to our perception of the immediate response to war - not least in the soldiers' recurring and important use of humour. Written by the men for the men, these verses reflect an aspect of the national character which contributes to our understanding of how they were able to endure. 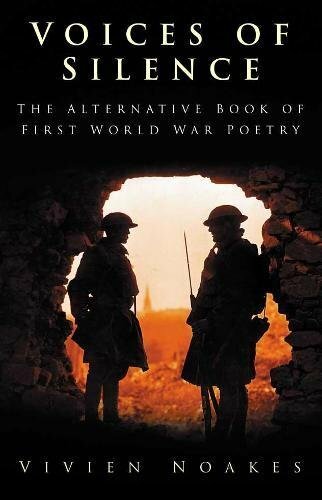 Vivien Noakes has a doctorate in the poetry of the First World War poet, Isaac Rosenberg, and has edited the definitive edition of Rosenberg's poetry for the Oxford University Press. She is the leading authority on the life and work of the nonsense poet and painter, Edward Lear, and her book Edward Lear: The Life of a Wanderer has recently been reissued by Sutton.